This guide will help you introduce pipeline-based continuous delivery to your development project. Continuous integration & delivery is not only a flavor of the month – it’s an industry standard. If you want to catch up with the hottest IT trends, this guide is for you. Also, in case you are already familiar with the continuous approach, you can simply skip the first part and move on to the pipelines section. The term continuous delivery is still a bit confusing, the more it’s often replaced by the notion of continuous deployment and mentioned in the context of continuous development. All the phrases stem from the agile approach to development, where the cycle time is cut down as much as possible. Why? The faster the product moves to the next stage of the development process, the faster you receive feedback and will be able to deliver another, better version – see graphics below. To benefit from continuous approach to development, you have to automate your work as much as possible. However, the implementation of the CD processes can be time and resource-consuming. In the next part of this guide we are going to show you how to easily implement the automated continuous approach in large and small projects using Buddy and its pipelines. A pipeline is a set of actions, executed by a Git push or by a developer in a specific order that delivers an app or website from a Git repository to wherever a developer wants. The pipeline resembles a little bit a production line, where some items are assembled, examined if they meet the quality standards, wrapped and packed in boxes and sent to the customers. In software development we simply skip fancy wrapping paper and decorative boxes and do our job – deliver software in a continuous manner. All the above actions should be performed automatically and you can easily achieve this with Buddy and the pipelines. Buddy offers the possibility to design continuous delivery pipelines tailored to individual needs. It supports all the general stages mentioned in the previous section. And actually Buddy can do much more. Let’s take a look at the functions. The main component in Buddy is a project. It consists of two main elements: a Git repository and a set of pipelines, defining when and how the source code from the repository will be processed (compiled, tested, prepared for deployment) and delivered to a given server. When you log into Buddy for the first time, you have to add new project and connect it to the Git repository you are going to automate (GitHub or BitBucket) or push your Git repository to Buddy (you can host your Git project in Buddy without any external provider). Let’s assume you have already created your project and connected it with the repository. Now you are ready to add the first pipeline. Go to Pipelines screen and click Add a new pipeline. Enter the pipeline name (MyFirstPipeline). Select trigger mode On every push and select the branch Master. Then, click Add a new pipeline. Buddy will create MyFirstPipeline and display the set of available actions. You can select other pipeline trigger modes (Recurrently or Manual) – see our help. You can select other branch options. – see our help. Now we are going to add actions (build application, deliver to server, restart application) to MyFirstPipeline. Usually your code requires compilation. Buddy allows you to build applications in Docker containers, which are more or less similar to virtual machines. The user defines what tool would be used during building the application and what commands would be executed. In our sample pipeline we shall build a Node.js application with Gulp. To do this, pick a pre-defined action for Node.js. 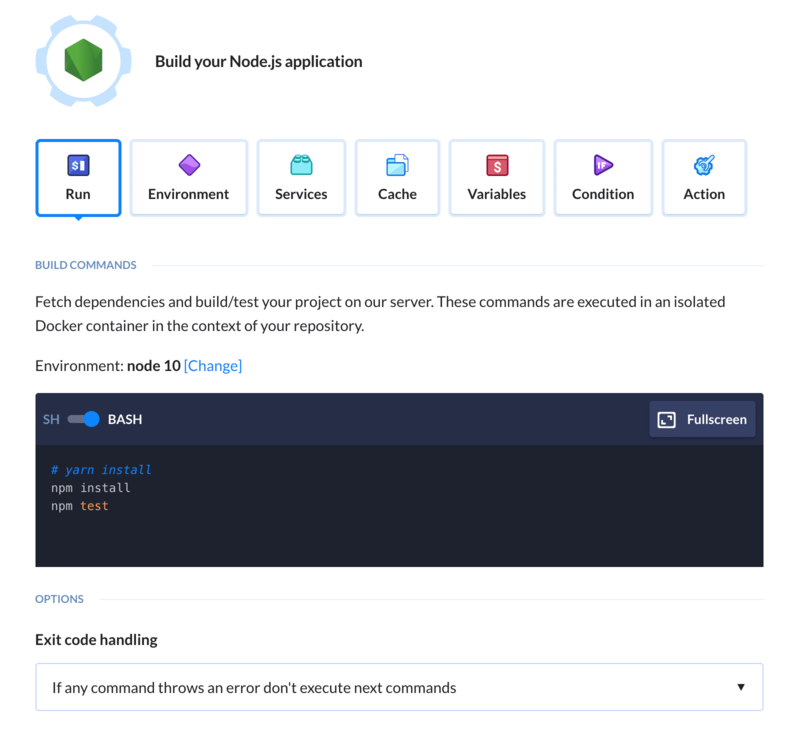 All we need to do now is enter the commands that will build the application, pick the version of Node and enter the commands that will install Gulp. We have just added the action that will build the application. Upon completion of this step, we need to upload the application to server. This can be performed by another action from Buddy’s actions set. You may chose from a variety of protocols like FTP/FTPS/SFTP or upload you application to Elastic Beanstalk, S3, Google Cloud Engine and so on. 3rd action: Pipeline, restart my app on the server. Quick! Very often you will need to perform certain operations on the server where you deployed your application, e.g. database update or service restart. All you need to do in Buddy is adding an SSH action, where you define the connection data and operations you want to perform. In our example we will connect with the server and restart the application. That’s it – your pipeline is ready. It will automatically build the application, deliver it to server and restart the application, notifying you if any of those operations fails. Let’s check how it works. 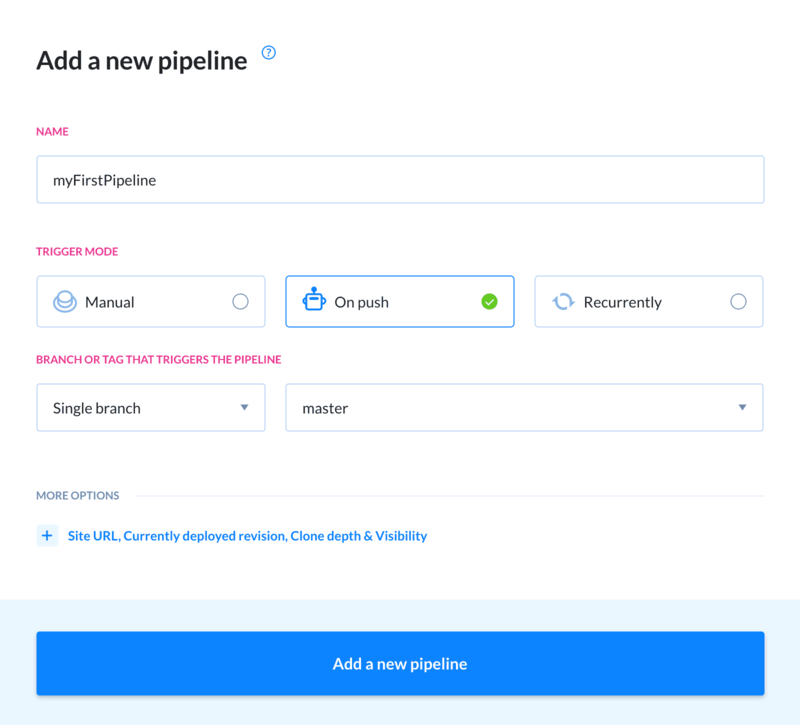 We defined the pipeline, which on every push to Master branch builds the application, uploads it to server and restarts application on the server. But what if any of these actions fails, for example if the upload is unsuccessful? The user should be notified. In Buddy all you need to do is adding a notification action in On failure section, where you can pick the appropriate option (e-mail, text message or Slack). When you open the Pipelines screen, you will find MyFirstPipeline on the list, together with other pipelines you defined. For each project you can define an unlimited number of pipelines. Usually they will include one pipeline that builds the application on every push and the pipeline that delivers the application to production server. The Pipelines screen also provides the information on when the pipeline was run, for which branch deploy is executed and if the server is up-to-date with the reference server. Here you can also check the pipelines currently in progress and the ones that failed since one of the actions in the pipeline failed. We are done – we learned how to create pipelines that would allow continuous delivery approach in our project. It will help you save time and deliver software in a more efficient way. This is just a brief summary on what Buddy offers regarding pipelines. If you are interested in our solution, you can read more about Buddy in other guides. Create a delivery pipeline that will build and deploy your app.